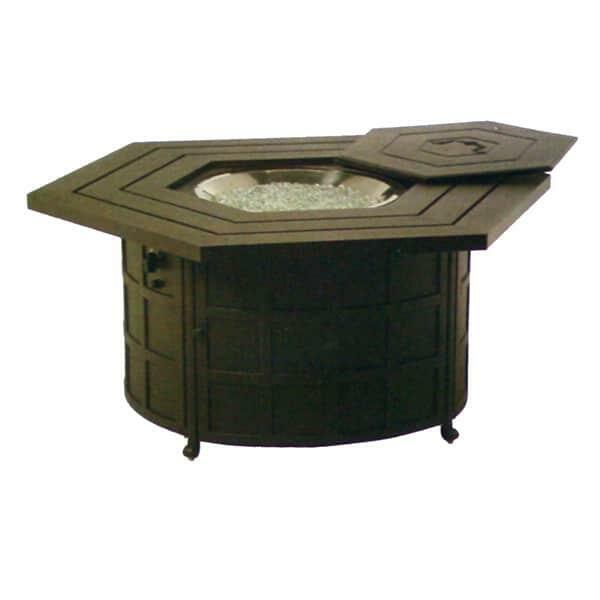 The Hanamint Sherwood Hexagonal Fire Pit Table is made of the sturdy all weather cast aluminum that is used to make all of Hanamint’s reliable outdoor furniture. The generous tabletop features the same design as other Sherwood furniture, and is ideally placed around other outdoor furniture for use as a fire pit and a table surface. Choose Sherwood furniture for an exact match, or use a different style. The cast aluminum is visually versatile for styling. A fire table is unlike almost any other patio accessory, as it can be used all year round. Bring a fire table outside for a summer barbeque, a fall session of marshmallow roasting, a winter morning on a screened in porch, or the first warm starry spring evening. The Hanamint fire pit table gives off a much higher level of BTUs than most fire pit tables. 60,000 BTUs is a substantial amount of actionable heat.